OK…So, I went to see Amy Schumer’s new movie “I Feel Pretty” (and received a button that says “I Feel Pretty Awesome,” which I wore all day).I liked it—the button AND the movie. There, I’ve said it. I liked it. Why is she being pilloried on social media for making such undeniably positive statements? The answer seems to be that some think she is too pretty to be saying these things? Is that it? Amy is too pretty to make a statement that benefits all women everywhere? (Sheesh) Get over your bad selves, nit-pickers. And, to the newly-wed Amy: YOU GO, GIRL! I couldn’t help but empathize with what she must be thinking and feeling as people hurl brick-bats at her for articulating the undeniable truth that most of us are insecure in some way and that it can often become almost a debilitating disease, if it inhibits us too much or prevents us from becoming our true, authentic, best selves. The film also gets the point across that TOO MUCH confidence is, well, too much. 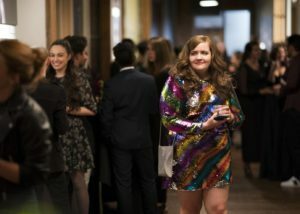 That is probably what the uproar is all about: mid-movie Amy briefly becomes a jerk to her friends (played by Aidy Bryant of SNL as Vivian and Busy Philipps as Jane) and we want to LIKE Amy and empathize with her. If she’s confident and thinks she’s great and is enjoying herself, well, we can’t have THAT now, can we? How dare she!? If you watch the trailer (above), you’ll see the funniest parts of the movie, complete with Amy’s attempt to win a bikini contest (she doesn’t), but, mainly, you’ll see her becoming a jerk as she gives in to her uber confident inner self, confidence which was triggered by a fall from a Soul Cycle bike that dumped her on her head. I’m thinking that her in-your-face confidence was just too much for some females to stomach. Be reassured: she doesn’t STAY a jerk. I actually wrote several humorous essays about exercise classes I have known and published them in “Laughing through Life,“ so if you want to hear all about the types of things that befall Amy in her class, but happened, IRL, to me, you can order a copy on Amazon. 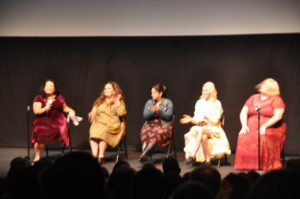 The point of the movie as written and directed by Abby Kohn (“2009’s “He’s Just Not That In To You”) and Marc Silverstein (husband of *BusyPhilipps,”How To Be Single”) to me, was that Amy wants each and every one of us who is female to feel comfortable in our own skins. So what if we have too much junk in the trunk? Forgetaboutit. So what if we are not rail-thin? Move on. Get over it! Be confident. BUT, and this is important, do NOT lose good friends because you become an insufferable ego-maniac. Many critics praised the appearance of Lauren Hutton as Gramma LeClaire (Lily LeClaire) in “I Feel Pretty,” who founded the cosmetics company, which is attempting to turn out an affordable cosmetics line suitable for sale in Target stores. Lauren appears as a retired model, which she really is. She made her film debut in 1968 in “Paper Lion” and still works as a model, apparently because she is still reed-thin. Lauren definitely has been out in the sun too much for too long and she has done nothing to diminish the age-related wrinkles caused by too much sun exposure. I actually looked up her age, after the film, since I was hoping she was older than me. She was…but not by that much. For someone who is listed as 74 (birthday: Nov. 17, 1943) she is thin, but, aside from that, she might consider whether the path she wants to take is the one taken by Jane Fonda, or the one taken by others, which doesn’t have to mean plastic surgery, but does mean trying to diminish age-related deterioration. Yes, I know. This is in direct opposition to the message of the movie, but the message of the movie for a young woman is quite different than for a “mature” (don’t say “old”) woman: society has not moved forward enough to accept prune-like visages that could have remained recognizable if the owner of the face had taken the slightest precautions. To me, since we are only given one face, it is irresponsible not to at least try to keep it looking halfway decent. While that also applies to our bodies, I agree with Amy that a woman in today’s society ought to NOT have to be reed-thin to be considered attractive. We women have to bear children and cook and clean and, usually, also work,and genetics will get you every time, so not all of us will remain emaciated in our golden years. Lauren is reed-thin, so she gets to keep modeling. She looks like hell, facially, but nevermind that, as long as she is thin. That, to me, was the message for we “mature” types and, yes, that was a contradiction of the first magnitude, which I blame(d) on the age difference between the character Amy is playing (Renee Bennett) and the one that Lauren Hutton is playing (Lily LeClaire). And probably something that the writers never considered, either, since the male writer (Marc Silverstein) is also the husband of Busy Philipps, [whois supposed to be getting a talk show this fall] and Abby Kohn might have tried for Jane Fonda for the Lauren Hutton role—or any other mature actress who has not thrown caution to the winds and abandoned her face to extensive sun damage.